For that much money I’d rather get a SCAR. SCARS cost more now, and the fact that the charging handle is reciprocating, makes it crappy. 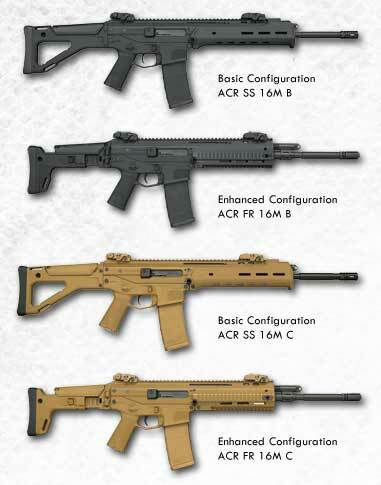 Trust me, Im a huge fan of FNH and even own one of there weapons, but the ACR is an easy choice over this one. Bushmaster screwed the pooch with this one. If they had been able to release the original MAGPUL caliber-flexible design with REASONABLE pricing say somewhere in the $1500 range, they would be flooded with orders. I for one was eagerly awaiting the ACR, but now I think I’ll look for something else, maybe build an SBR suppressed M4 clone instead. I bet they will still be producing them as fast as they can to fill the orders. I agree with you that they probably lost a lot of civilian orders, but probably not enough to make them care. You would probably have a lot more fun with a SBR suppressed m4 anyway! By the time all the military trials were done, and the Bush-Rem ACR got it’s upteenth redesign, the rifle went from an estimated $1,500 retail Oct ’09 release to a real world retail (not MSRP) sale of $2,505 for the Basic Configuration, and $2,800 for Enhanced Configuration. And isn’t this the same rifle as the XM9? Why 2 years delay in releasing a modular rifle that was already designed? AND a $1,000 increase in cost. Personally, I’m not paying over $2.5k for a rifle. Come on, this one isn’t automatic or match grade even. I’d have to agree with you Ed. I’m pretty sure a large factor in the price is greed. They knew that due to all the hype surrounding the rifle it would basically sell itself anyways at the higher cost. I wouldn’t be surprised if they dropped the price significantly after sales slow down. Lets get this one thing straight, Bushmaster has always had good reasonable prices on there weapons and have proven to be very reliable. The increase in the prices for fire arms have greatly increased since that quran thumpin haji, Obama, has stepped into office. That dirt bag has been tryin his best to destroy the 2nd amendment in any way he can, which includes forcing the firearms manufactures to increase there prices. Lets also not forget the type of operating system this and other new ARs are packing, Piston Driven. I just bought a brand new ACR for 2400, yes thats alot, but its gonna last for a life time. Id rather spend 2400 on a Piston AR than throwing away 700 on an AR that easily miss-feeds do to fast carbon build. Theres alot of good things about the Piston Operated ARs. Show me proof that Obama has done anything to change our rights dirt bag! we are still creating and buying anything we want. Individual states make their own gun laws dumb@$$.